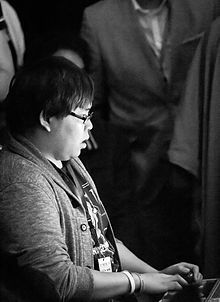 Justin Wong (born November 15, 1985) is a Chinese-American professional fighting game player. His name is sometimes shortened to just Jwong. Wong has won more Evolution Championship Series titles than anyone else, including eight titles with the Marvel vs. Capcom series. Wong took part in GameStop's Street Fighter IV US National Tournament in 2009, which he won. After the main tournament, a set of special exhibition matches of Street Fighter IV took place in San Francisco, California, on April 18 after the actual competition ended. It featured Iyo who had recently won the Japanese National SFIV tournament, Poongko who won the Korean SFIV National Tournament, and Daigo Umehara who came by Capcom's invitation, and Wong himself. Wong defeated Iyo and Poongko, but lost to Umehara who went on to win the tournament. He was awarded a tournament seed at Evolution 2009 in Las Vegas. Wong gained more fame after the footage of his matches in GameStop's competition were spread on the internet. As of July 19, 2009, the video of the match against Umehara received almost 80,000 hits on Niconico video sharing site. For winning the US GameStop tournament, Wong started his Street Fighter IV competition as a seeded player in the semi-finals on July 18, which is the second day of Evo 2009. He beat 4 opponents and had to start the next day by playing against Daigo Umehara. In the third and the last day, Umehara defeated Wong and put him into the Losers Bracket, then advanced to the grand finals just to meet Wong again. In the final showdown, Wong changed his character from Abel to Balrog (boxer, called M. Bison in Japan) to counter Umehara's signature Ryu. The two fought until the last game possible, but Wong lost the competition. It was this point of the tournament that had more than 23,000 users viewing the stream broadcasting. Wong joined a tournament called Seasons Beatings on October 16–18 in Columbus, Ohio. He participated in the Street Fighter IV 3 on 3 on the second day with two teammates and won 1st place. There was an exhibition match between him and Daigo Umehara which he lost by two games to ten. For Street Fighter IV Singles, Justin, who this time chose to play Fei Long, won in the Winners Bracket's final against Umehara. He later lost to Umehara after Umehara bounced back from the Loser's Bracket. In June 2010, Wong left the competitive gaming group Empire Arcadia and signed with professional gaming organization Evil Geniuses with Martin "Marn" Phan and was later joined by Ricki Ortiz. Wong won the Marvel vs Capcom 2 tournament coming out of the loser's bracket. He also placed just out of the top 8 in Super Street Fighter IV, losing to Bruce "Gamerbee" Hsiang in an exciting match. Wong also participated in the reality show WCG Ultimate Gamer. He made it as far as the Gauntlet (series of semi-final elimination challenges), but was eliminated during the Forza Motorsport 3 driving challenge. Wong stormed through the tournament without losing a set up until the grand finals where he won the tournament and the $10,000 1st prize using Kung Lao, playing against Floe's Ermac in the finals. In 2015, Wong was announced be participating in the Red Bull Kumite 2016 Street Fighter V invitational tournament. ^ Livingston, Tim (2008-08-19). "EVO 2K8: Fighting Games Personified". Sports Joystick. Archived from the original on 2008-12-02. Retrieved 2011-03-04. ^ Spitalieri, Mike (2007-03-22). "The 9 biggest moments in pro gaming". GamePro. Archived from the original on 2008-10-21. Retrieved 2011-03-04. ^ McCarthy, Dave (2006-08-31). "The best of YouTube Article". EuroGamer. Retrieved 2011-03-04. ^ Miller, Pat (2007-03-13). "Fei Long and Justin Wong". The Escapist Magazine. Retrieved 2011-03-04. ^ Oichi (2009-05-31). "Arcadia July - Umehara Six Page Interview". VersusCity. Archived from the original on 2016-10-17. Retrieved 2009-07-19. ^ Ng, Terry (2009-04-19). "Justin Wong Wins SFIV National Tournament and Daigo Wins International Title". Kineda. Archived from the original on 2009-05-20. Retrieved 2009-07-19. ^ Gilbert, Ben (2009-04-19). "Justin Wong wins national SFIV tourney, Daigo remains world champ". Joystiq. Retrieved 2011-03-04. ^ Bright, Hailey (2009-06-21). "Justin Wong (Street Fighter IV National Champion)". Coin-Op TV. Retrieved 2011-03-04. ^ "ストⅣ世界大会　ジャスティン×ウメハラ【高画質】". 2009-04-21. Retrieved 2009-07-19. ^ Evo2009 (2009-07-16). "Evo2009 SFIV: Semi-Finals Winners Bracket". Evolution Championship Series. Archived from the original on 2009-07-20. Retrieved 2009-07-19. ^ Ng, Terry (2009-07-20). "Daigo Wins Evo 2009 Street Fighter IV Championship Title — Defeats Justin Wong". Kineda. Archived from the original on 2009-07-23. Retrieved 2009-07-20. ^ "Evo 2009 Live Broadcast". Shoryuken. 2009-07-20. Retrieved 2009-07-20. ^ "Seasons Beatings IV live broadcast from Ohio". Get Your Tournament. 2009-10-16. Retrieved 2009-10-17. ^ "Seasons Beatings IV". Get Your Tournament. 2009-10-16. Archived from the original on 2009-10-17. Retrieved 2009-10-17. ^ Catalyst (2009-10-18). "Seasons Beatings IV live now, with early results". EventHubs. Retrieved 2009-10-18. ^ "Seasons Beatings IV". Frame Advantage. 2009-10-18. Retrieved 2009-10-22. ^ dunn (2010-06-24). "Evil Geniuses welcomes Justin Wong". Archived from the original on 2011-07-23. Retrieved 2011-02-22. ^ Izuna (2010-07-11). "Justin Wong Wins MvC2 EVO 2010". 1up. Archived from the original on 2011-06-29. Retrieved 2011-03-04. ^ Protocol Snow (2010-07-15). "EVO 2010 — Taiwan shocks the world". Protocol Snow. Retrieved 2011-03-04. ^ "Meet: Justin Wong". Archived from the original on 2011-03-04. Retrieved 2011-02-22. This page was last edited on 2 April 2019, at 18:51 (UTC).